So after much procastination, I have decided on my challenge for 2012. We want to shift our fundraising efforts to target a cure for Type 1 Diabetes, and so will be fund raising from now on for the JDRF – the Juvenile Diabetes Research Foundation. As a charity dedicated to Type 1 Diabetes alone, and more focused on a finding a cure, Nikki and I feel they better represent a chance for a future for Samuel, than other charities. This isn’t to say other charities are worse – just different, and less targeted towards Samuel! 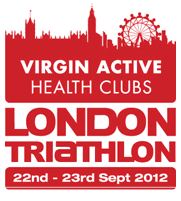 To support the JDRF, I have entered the Virgin Active London Triathlon. As a loyal reader (rolls eyes? ), you’ll know I’ve done a few triathlons and duathlons to date, including the ITU Dextrose London Triathlon last year. However, these were all Sprint Distance Triathlons (750m swim/20k ride/5k run). My challenge this year is to up the distance…. So, this Triathlon will be double the distance! Olympic distance to be precise. A 1500m swim (just under a mile) in the London Docklands, followed by a 40km (25mile) ride to Westminster and back, then a 10km (6mile) run around Canary Wharf. When I did the Sprint Distance last year, it took me 1hr32mins, so I think I’m going to target getting under 3 hours for double distance…..
Good luck mate. You will do great amd I’m sure you’ll beat your goal of 3 hours. Make sure you let me know where I can sponsor you. Cheers. Will get a proper link up for sponsorship ASAP!